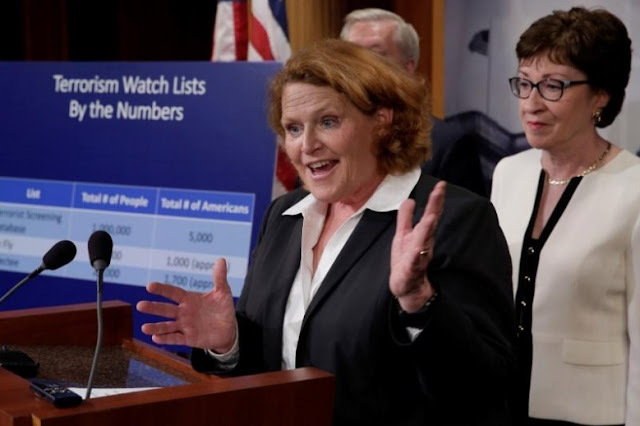 FILE PHOTO: Senator Heidi Heitkamp (D-ND) speaks at a news conference on Capitol Hill in Washington, D.C., U.S., to unveil a compromise proposal on gun control measures, June 21, 2016. WASHINGTON - A U.S. senator called on Tuesday for a criminal probe of actions taken by executives of credit bureau Equifax after a massive data breach this summer and said their actions were comparable to insider trading. Senator Heidi Heitkamp, a North Dakota Democrat who sits on the Senate Banking Committee, said it was “disturbing” that it appeared executives sold nearly two million dollars’ worth of company stock in the gap between learning of a sweeping hacker intrusion and making it public. Equifax announced last week that it learned on July 29 that hackers had infiltrated its systems in mid-May, gaining access to a wide swath of personal information, in what cyber security experts believe is one of the largest data hacks ever disclosed. Also on Tuesday, Senator Gary Peters, a Michigan Democrat, called on the Federal Trade Commission to launch its own Equifax probe. Specifically, he called for an investigation of whether the company misled consumers by saying it considered protecting customer information a top priority. The company did not immediately respond to Heitkamp’s comments. A U.S. senator called on Tuesday for a criminal probe of actions taken by executives of credit bureau Equifax after a massive data breach this summer and said their actions were comparable to insider trading.